Akio Toyoda to don the Nomex for tough enduro. Following in the tyre tracks of Aston Martin's motor sport-mad chief executive Ulrich Bez, another car company trump is set to embark on a drive on the wild side - in the 24 Hours of Nurburgring. 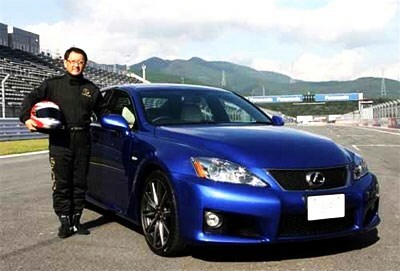 Toyota's incoming President Akio Toyoda, the 52-year-old grandson of the company's founder, has been named as one of the four factory drivers of a Lexus LF-A in the legendary German endurance classic on May 23-24. Like many car makers, Toyota has been using the Nurburgring race - one of the maddest and toughest anywhere - as an active test bed for its products. With the new boss in the thick of things, the engineers will be hoping the LF-A doesn't encounter the embarrassing issues it had in last year's 'Ring classic. Nearly 200 cars have been entered in the 2009 marathon.